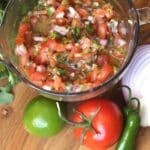 Fresh, spicy, Mexican salsa is one of my family’s favorite snacks almost every day of the year. 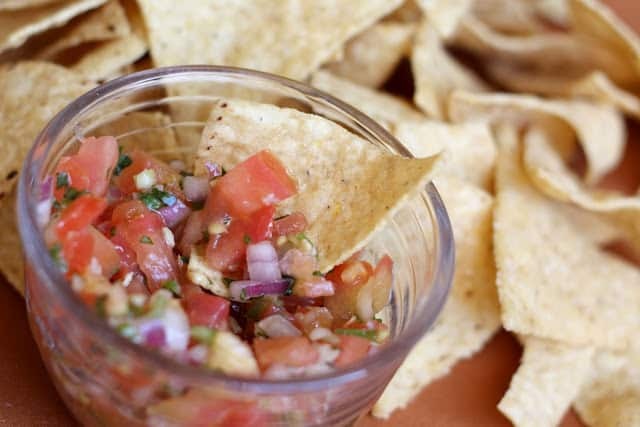 Pico de Gallo is the ultimate fresh salsa and we love it so very much. 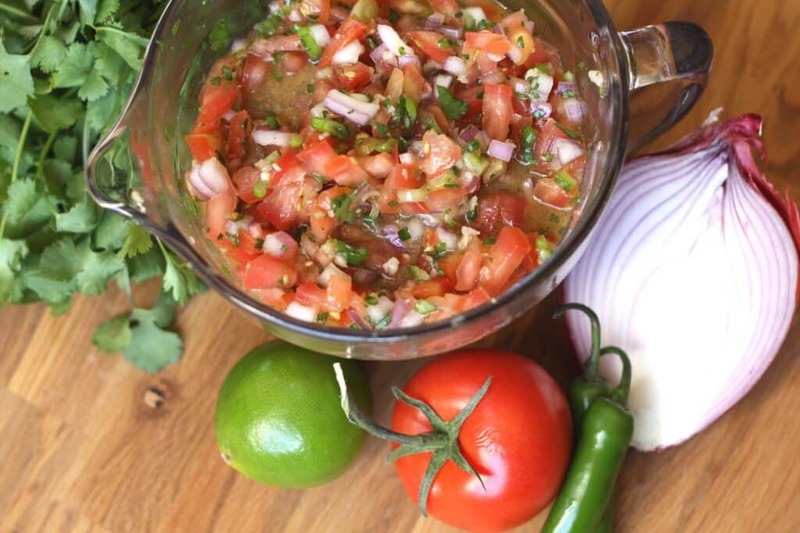 For many years, I avoided making my own salsas. 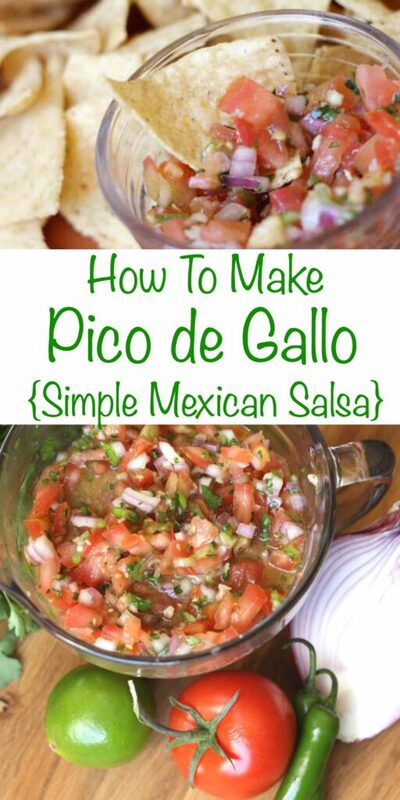 The recipes seemed complicated, or I just didn’t care much for the homemade salsas that I had tried. We are admittedly, somewhat picky about our homemade salsas. While we enjoy endless varieties of store bought salsas, most of the homemade versions never tasted quite right to me. However, several years ago, when tomato season arrives, it was time to try again. Being in the desert, our farmer’s market sells fresh organic tomatoes almost year round, but I much prefer the price when I am pulling them from our own garden! I wanted a fresh salsa to go with the Carne Asada I was making for dinner and this turned out to be absolutely perfect with it. My oldest son loved it and has eaten this with almost every meal since then. It was awesome on eggs and on rice; we loved it with our enchiladas as well. The key here is to very finely dice as many of the ingredients as possible. This let the flavors really meld together without huge chunks of tomatoes or onions to distract from the flavor. I went easy on the cilantro as well, because cilantro has killed many a salsa dish in my own experience. If you love cilantro, go crazy with it and feel free to add just as much as your family likes! Kitchen Tip: I use this knife and this bowl to make this recipe. In a medium size mixing bowl, combine all ingredients. Toss thoroughly. Let sit for at least 15 minutes to allow flavors to meld or chill in the refrigerator until ready to serve. I wish that every recipe that calls for Jalapeno pepper would have a caution about using gloves to cut them up. My first use of fresh Jalapenos following a recipe ended with severe bronchospasm and a trip to the ER so I could breathe.